Amatrol’s Inventory Storage Station (87-MS7) is the seventh station of the 870 Mechatronics Learning System and allows learners to gain valuable skills used in inventory storage processes by studying operation, adjustment, and programming of an inventory storage system.. This learning system will allow learners to practice and study operating a programmable parts storage station, adjusting a phototransistor optical interrupter switch, and designing a PLC program that provides manual/auto/reset functions for a programmable parts storage station. 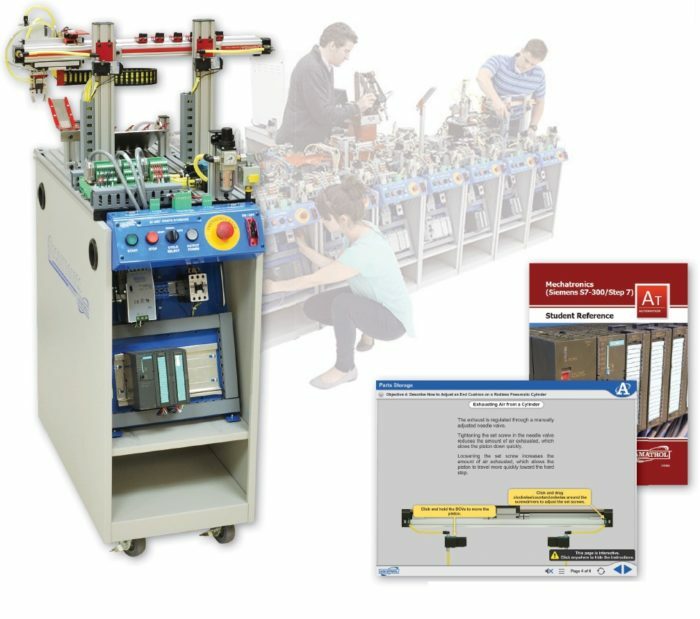 This mechatronics learning system features real-world components like infrared sensors, pneumatic grippers and brakes, pick and place storage and more! Learners will use these and other components to practice mechatronics safety, torque clamp module sequencing, station operation, and non-servo electric slide sequencing. Amatrol uses components that learners will find on-the-job in order to give the best opportunity to build confidence and industrial competencies. The 87-MS1 is a mobile workstation with slotted work surface that contains an operator station, powered feed module, pneumatic pick and place manipulator, finished parts storage module, parts set, a pneumatic distribution module as well as an electrical distribution module, an electro-pneumatic valve manifold, and a digital I/O interface module. Learners will use these components to practice vital mechatronics skills, such as: adjusting shock absorbers; operating pneumatic manipulators; sequencing powered parts feeders; and more. Amatrol’s world-class curriculum, which comes with the selected PLC, combines strong theoretical knowledge and concepts with hands-on skills for the best industrial competency-building on the market. This thorough, exceptionally detailed curriculum is built to begin with the basics and steadily advance to more complex concepts and skill. The Inventory Storage station teaches interfacing, problem solving, programming, sequencing and operation for pick and place storage, pneumatic grippers and brakes, infrared sensors, and a programmable pneumatic traverse module. This station sorts the completed assemblies of working industrial directional control valves. Interactive multimedia is included for select Allen Bradley and Siemens processors. The 87-MS7 is just one of the world-class mechatronics training options offered by Amatrol. Other mechatronics stations include Pick and Place (87-MS1), Gauging Station (87-MS2), Orientation Processing 87-MS3), Sorting/Buffering 87-MS4), Servo Robotic Assembly (87-MS5-P2), Torque Assembly (87-MS6), and CNC Mill – Denford CNC Micromill (87-MS8M60), and Mechatronics Hydraulic Press Learning System (87-MS9). Additionally, Amatrol offers Mechatronics PLC training with both Siemens S7300 and Allen-Bradley CompactLogix PLCs. While an Amatrol Mechatronics line can feature just Allen-Bradley or Siemens PLCs, this automated line also allows for a mix so that learners can train on industry’s two most widely-utilized PLCs simultaneously. A sample copy of the Mechatronics Student Reference Guide is also included with the system for your evaluation. Sourced from the system’s curriculum, the Student Reference Guide takes the entire series’ technical content contained in the learning objectives and combines them into one perfectly-bound book. Student Reference Guides supplement this course by providing a condensed, inexpensive reference tool that learners will fi nd invaluable once they finish their training making it the perfect course takeaway.